According to the Farmers’ Almanac, we are not only in for a very wet (snowy) winter, but also a “numbing” cold winter. Aside from the difficulties of keeping yourself safe and warm, if you own or manage a commercial building, the problem gets worse. Winter can be very hard on a roof, especially one that is already showing signs of wear and tear. But what is it about the winter that can be so tough on your roof. Let’s discuss two of the culprits: Cold and Ice. First of all, the cold is tough on your roof when it is combined with warmth. 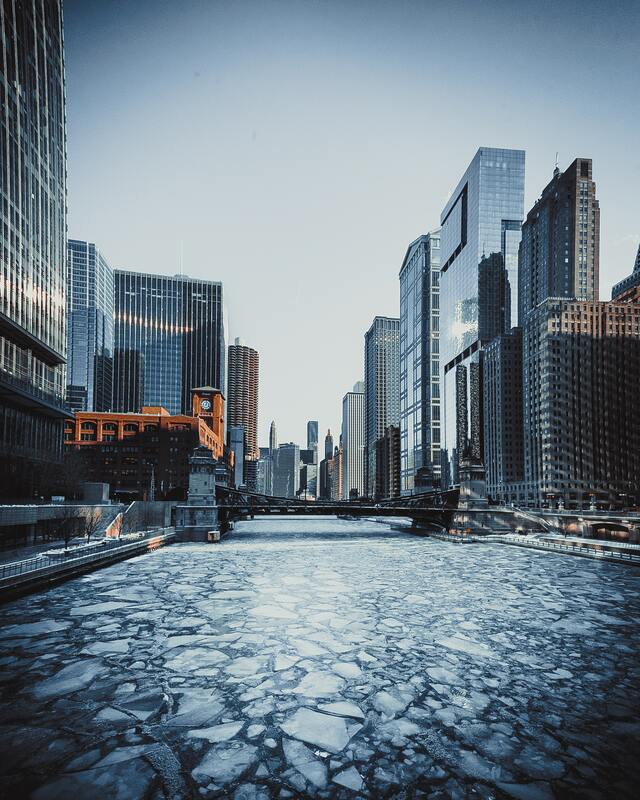 During the course of a Chicago winter, it is not uncommon for the daytime high temperatures to reach 50 degrees (or more) and then at night the temperature dips to freezing (or lower). This fluctuation in temperature is calledthermal shock – called “shock” for good reason. When the temperature gets warmer the building’s structure, including the roof, begins to expand. Then when the temperature gets colder, the building’s structure begins to contract. The more extreme the temperature fluctuation is, the greater this expansion and contraction. Look at your roof like a rubber band. Take a rubber band and hold it out in front of you – one side in your left hand and one side in your right hand. Now begin to stretch that rubber band close to what you think the breaking point is and then let it go slack again. Keep doing that several times and you’ll notice something important. What you may first notice is that the rubber band begins to loose its tensile strength, taking less effort to pull it to its breaking point. The second thing you might have noticed if you stretched and loosened the rubber band enough times is complete failure – the rubber band breaks. Now a rubber band is designed to address these types of extremes, but will still fail if stretched enough times. A roof is not necessarily designed for such extremes. Every day, every night; day after day; season after season; year after year. The toll on your roof is significant. Expansion joints crack and separate, seams tear loose, roofing materials break down and deteriorate, and on and on. The end result is a failing roof. The second item that was mentioned was that of ICE. Of course, this is more specific to wintertime conditions. It is also one of the most destructive elements that your roof will be likely to encounter. Why? When it snows on your roof often times the first layer of snow melts as it comes into contact with the relative warmth of the building. That “liquid snow” gets into your roof’s cracks and crevices. Then as the snow continues to fall, the wet, watery snow underneath begins to freeze. When it freezes, that moisture within those cracks and crevices expands. This expansion makes any defects in the roof worse. Now what happens when you get a warm day and a bulk – if not all – of the rooftop snow begins to melt? The process is started over. Because now the melting snow also seeks out and finds additional cracks and crevices. Then when the temperatures drop again during the night, that water freezes and expands again. Similar to thermal shock, this constant freezing and thawing of snow exacerbates any defects in the roof. The older and more damaged your roof, the more profound the freeze-thaw-freeze effect will have. So your roof will encounter thermal shock as well as the expansion and contraction related to freezing & thawing snow. It is unavoidable in the Illinois climate. So what can you do to reduce the negative effects of these destructive processes? One thing is to make sure that there is adequate drainage on your roof so that any rain or snowmelt is able to get off of your roof before it is able to freeze (or refreeze as the case may be). Ultimately every roof is different and exists in a unique local environment. All of this makes it impossible to put the same “fix” to every roof. Every roof is different. Therefore, the best way to know your roof’s specific needs is to have your roof inspected and maintained on a regular basis. As the roof ages and the membrane endures these thermal shocks, the more frequently these visits occur. Speak with your Certified Roof Care Specialist today to make certain you are ready for this winter. If you should have any additional buildings not currently under our care, let one of our Customer Care Specialists know so that we can assess with a FREE 25-Point Inspection that will provide you with specific and significant insight into the needs of your particular roof. Call us today at (847)669-3444.